Couple of days ago, I posted about Soulflower haul which I had done from their official website. 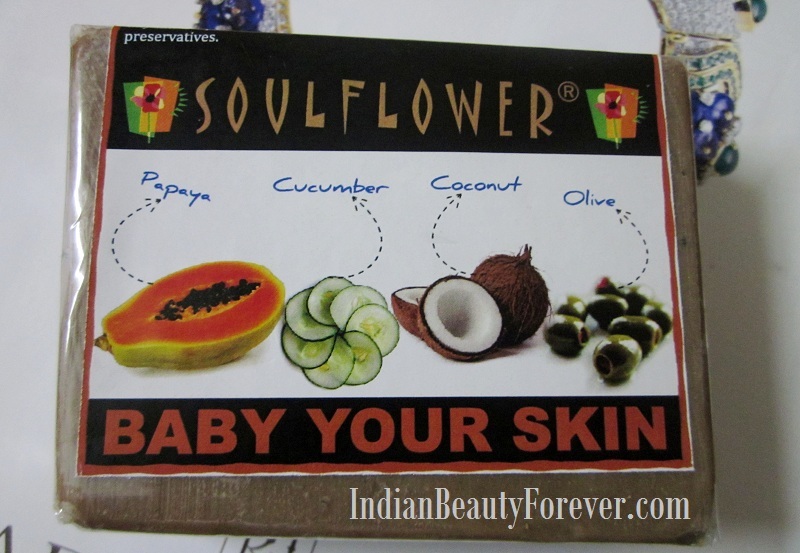 I purchased this soulflower Baby your skin soap. I have heard a lot about this soap which made me wanted to try it soon and I wanted to test how it will fare for my skin. Price- 200 INR for 150 g and it has a shelf life of 3 years. My last facial cleanser before this was Ponds Pimple clear white which was a foaming facewash. I will not say that was bad at all but it was not for my combination skin as it tends to dry out the normal face areas at times while the oilier parts were in control for around a couple of hours. All this made me conclude that that face wash can be a good option for very oily skin. Anyways!! now, I have been using this Baby your skin soap for the past so many days and I am ready to share the experience and review it. It’s a handmade soap. Now, when we say handmade soap what do you we understand? Actually, handmade soaps are made in small batches and are high in glycerin that acts as natural moisturizing agents. 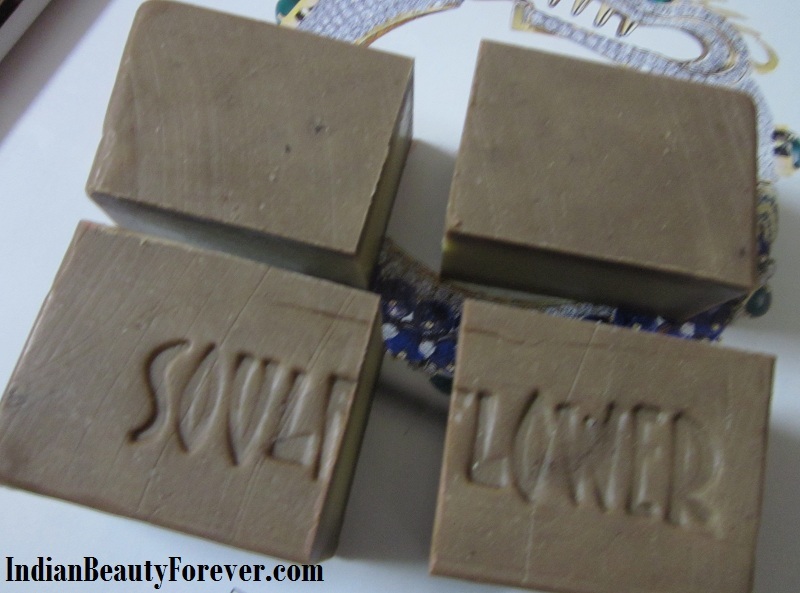 Most of these handmade soaps are devoid of artificial hardeners or preservatives which makes them more natural as compared to the commercial soaps produced with the machines and in large batches. This soap says that it contains, papaya, cucumber, thai mud clay, Fresh aloe vera juice, Yoghurt, Vitamin E, Glycerin, Saponified Oils of Olive, coconut, castor, palm and palm kernel. In simple term, a soap is derived when vegetable oil or fatty acids are mixed with strong alkali like Sodium hydroxide (NaOH). 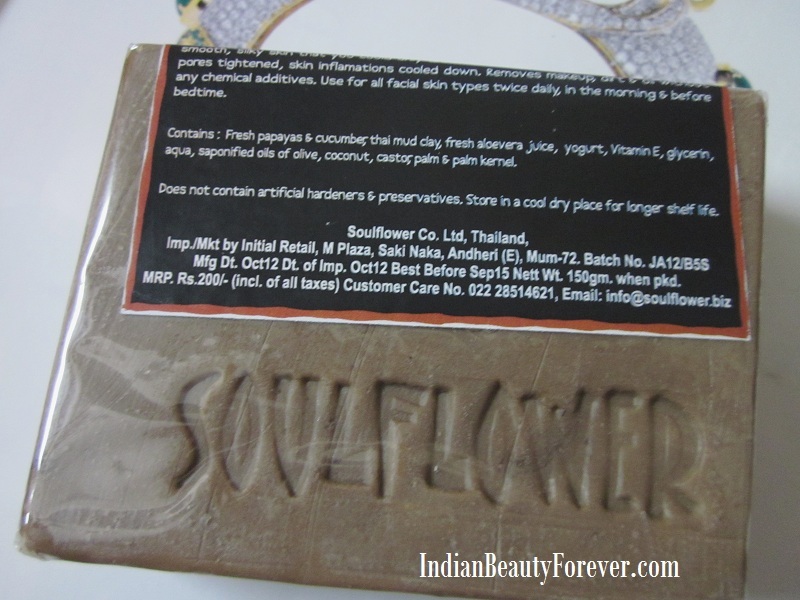 In this soap they have used Saponified Oils of Olive, coconut, castor, palm and palm kernel which means that these oils has been treated with a strong alkali so that it can lather well and also gives the soap the goodness of all the oils that they have mentioned and also which cannot be used in its usual oil form on the skin, due to comedogenic nature of some of these, coconut oil being the highest rated when it comes to comedogenic score of any oil. Other ingredients like papaya which has anti aging properties, Cucumber and aloe vera smoothens and soothes the skin, yoghurt gently exfoliates and lightens the skin tone and Glycerin gives moisture along with the goodness of Vitamin E.
Now, these were the ingredients and what this soap contains so let’s move on with, how this soap actually feels like and performs. It comes in a rectangular bar which is 150 g by weight and approximately 4 by 3 inches in dimensions. I wanted this for my face only, so what I did, I cut it into 4 pieces with a knife, Since there are no hardeners used, it was really soft to cut. Once I cut it I saw a beige/creamy core inside which I would have not seen, if I hadn’t cut it and using it just in its original form until It use it till the half of it’s weight. These handmade organic soaps should be kept in a dry place as they are soft and can dissolve fast so to prevent any wastage. It lathers well and creamy. It cleanses my skin decently, takes off the excess oil from the oilier parts of my face and till date I have not experienced any dryness after using this. Though I will not recommend it for very oily skin reason being the oilier parts tend to get shiny after sometime. So, very oily skinned people can skip. I have not had any breakouts since the time I have been using it and also I have seen that it calms my skin. If you will use this bar only as a facial cleanser then it will last for longer and the price will be justifies else, it can be pricey if you want to use it for the body as well! Price is affordable, if it is used only for face cleansing. It has no artificial preservatives or hardeners which makes it natural and harmful chemical free. Smells really good like coconut chocolate though chocholate isn’t an ingredient, that may be due to papaya, coconut and clay that may give it that smell. It forms creamy lather which gives a luxurious feel along with its intoxicating smell. It cleanses the skin very well and even removes makeup except the waterproof ones. Skin feels refreshed, hydrated and smooth. There is no dryness or stretchiness. It calms and soothes the irritated skin as my skin was irritated when I started using it and it helped reducing the redness around my nose. It does tighten the pores though temporarily and you may know these things cannot tighten the pores permanently. It may not work as effectively for very oily skin as it can do for combination, normal and even dry skin. Price can be high if you wish to use it for bath. It can dissolve fast, so have to make sure that you keep it in dry place after the use. 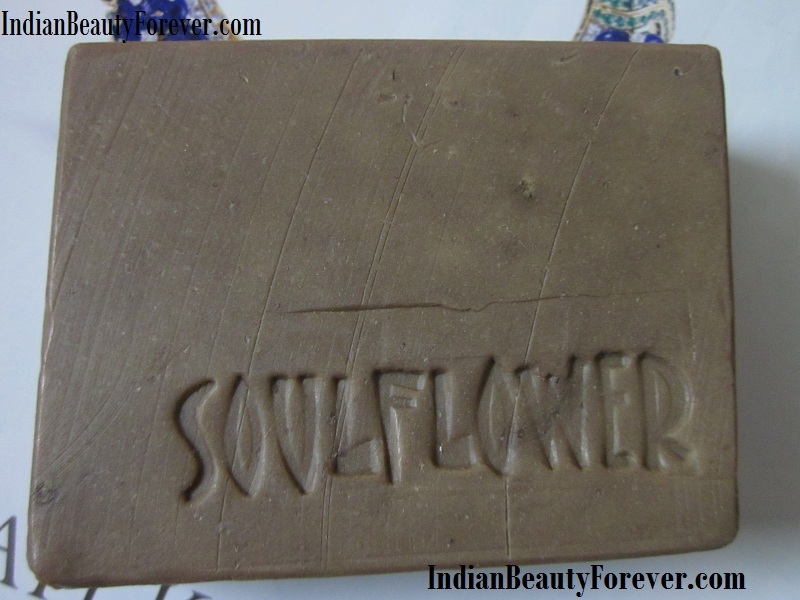 Take- I will say Soulflower baby your skin is a decent soap when it comes to cleaning your face but if you see it’s devoid of chemicals, has loads of good ingredients like papaya, yoghurt, cucumber etc and it also soothes the skin which makes it a good option for people with dry to combination skin though not for very oily skin. Skin feels pampered with this soap and it makes me satisfied with this product that my money wasn’t wasted! It decent and calms the skins! i want to try this! yummy!! Thnaks Nids! :) It works well and smells yummy! It's pretty decent and worth trying unless we have very oily skin. Coconut Barfi! wow....That must have been hard to resist...lol.. I have heard rave reviews of this one...I think I should give this a try now...Great review Niesha! Wow! 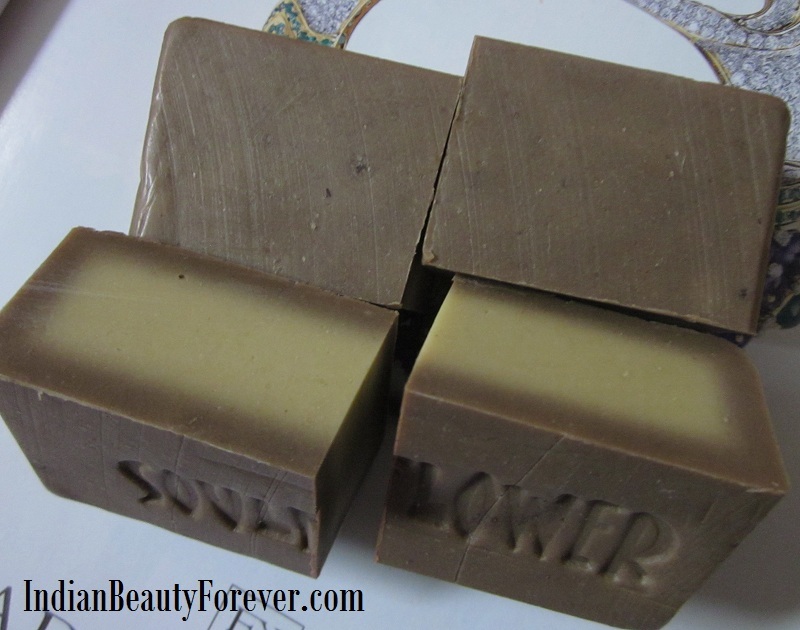 it looks yummilicious..Need to try this out i love organic soaps. Thanks dear. :) On the Rakhi day, I gave once piece to my cousin and even he thought earlier that it's a sweet that I am offering him.lol :) since it has a lighter core and smells yum! I think if you do not have very oily skin then I you may try this, Hopefully, you will like it. :) It has calmed my irritated skin and reduced the redness as well. Good to hear that Lavanya! then in that case you can try this too. :) Hopefully it will give good results. I know how I resist myself not eating it! Never knew these soaps can b used on face too. Nice review Nieshu. Will give it a try! I Think I'll Skip This As The Ingredients Don't Look Good For My Super Oily Skin! I Loved Your Detailed Review n Would Surely Recommend To My Frnd Who Has Dry Skin. hehe That's what I could think of at the time of review. :D lol. No, it may not suit very oily skin. better to skip then.